ANKARA • There is only one major group of combatants in the Syrian war that is backed by both Russia and the United States - and now Turkey is attacking it. Since the weekend, Turkey has unleashed its 155mm heavy guns across the border with Syria. The targets are Kurdish forces, whose recent advance is a key part of the Russian plan to extend President Bashar al-Assad's control over Syria. Turkish President Recep Tayyip Erdogan has refused to stop the shelling and said Turkey was acting in self-defence. Syria's five-year war has turned into a tangled web of proxy conflicts between global and regional powers, with a growing risk that some of them could clash directly. Right now, the most dangerous flashpoint is between Russia and Nato member Turkey, which shot down a Russian plane in November. Since then tensions have steadily built up as the Assad-Russia alliance - with help from the Kurds - threatens to surround Turkish-backed rebels in Aleppo, Syria's biggest city. "Both Russia and Turkey are looking to position for strategic advantage," Mr Tim Ash, head of emerging-market strategy at Nomura in London, said by e-mail on Monday. The irony is that even while Turkey faces off against Nato foe Russia, its policies are also putting it at odds with leaders of the Western coalition. The US shares Turkey's desire to halt the Assad advance, and its suspicion of Russian intentions. But on the subject of Syria's Kurds, there is a sharp difference. Turkey says the main Kurdish fighting unit, the People's Protection Units (YPG), is a terrorist group that is in league with autonomy-seeking Kurdistan Workers' Party (PKK) militants inside Turkey. The US, however, views the Syrian Kurds as a proven battlefield ally against the Islamic State in Iraq and Syria. Two weeks before Turkey started shelling them, US President Barack Obama's envoy for the coalition against ISIS, Mr Brett McGurk, visited YPG fighters in Syria to congratulate them. Turkey says its attacks on the Kurds were in retaliation for cross-border shooting, but most analysts say Turkey is unlikely to carry out a major incursion that would put its troops under Russian fire. The once-friendly relationship between Ankara and Moscow has deteriorated since Russia entered the Syrian war on Mr Assad's side last September. The rebels, backed by Turkey and other US allies including Saudi Arabia, have been withering under Russian bombing that has helped Mr Assad regain territory. For Mr Erdogan, two threats are unfolding simultaneously. In the short term, a Russian-backed Kurdish advance could cut supplies to the rebel groups Turkey has been backing for years, increasing the chance that Mr Assad will recapture Aleppo and survive in power. 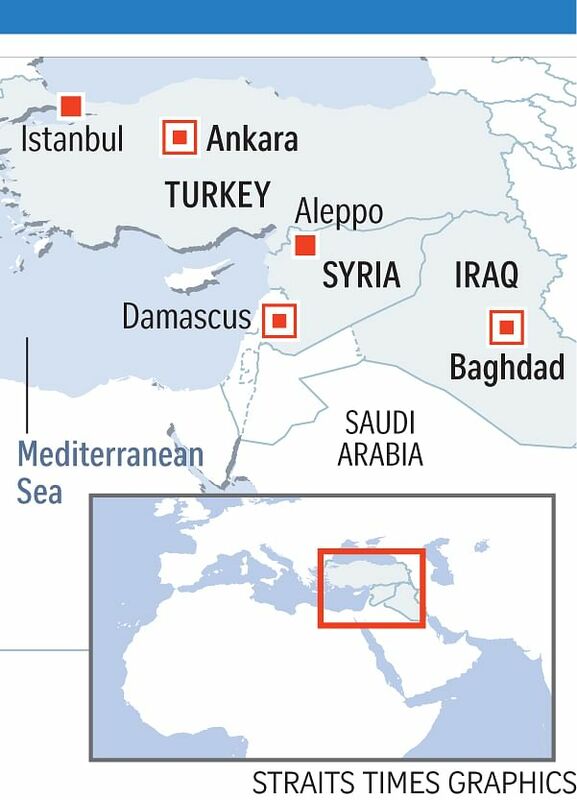 That would be the latest blow to Mr Erdogan's policy in the Middle East - he has already lost allies in Egypt and Iraq. In the longer term, Turkey is wary of territorial gains for the Syrian Kurds that could eventually deliver them a state of their own, and fuel similar aspirations among Turkey's Kurdish minority. Mr Erdogan says Russian air strikes are allowing the Kurds to drive ethnic Turkmens and Arabs away from the border areas, deepening the refugee crisis. The PKK has been fighting Turkish troops since the 1980s and is considered a terrorist group by Turkey, the US and the European Union. The US has acknowledged some of Turkey's concerns. In a phone call with Turkish premier Ahmet Davutoglu, Vice-President Joe Biden said efforts were being made "to discourage Syrian Kurdish forces from exploiting current circumstances to seize additional territory near the Turkish border", the White House said on Sunday. But Mr Biden also urged Turkey "to show reciprocal restraint by ceasing artillery strikes in the area". Dr Michael Gunter, author of several books on the Kurds and a professor of political science at Tennessee Tech University in Cookeville, said that if Turkey takes further action to counter the Kurds and Russia, "things could quickly escalate into a greater confrontation which nobody in their correct mind would want".